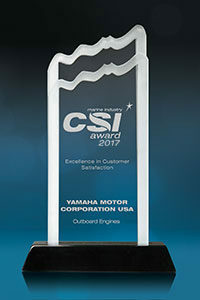 The National Marine Manufacturers Association has once again recognized Yamaha with a CSI Award for Excellence Customer Satisfaction. This award makes the sixteenth consecutive award for Yamaha, a claim no other manufacturer can make. Yamaha is the only outboard manufacturer in history to win 16 consecutive Marine Customer Satisfaction Index (CSI) Awards. At IBC we are a “5 Star Gold Rated” sales and service center and offer an unequalled Yamaha experience for sales, parts, and service. Give IBC a call at (503)235-2628 for your next Yamaha outboard or outboard service and get the service you deserve.